The following is an excerpt from Rotary District 9800's The Networker. It was written by Matthew Scott, a past participant of a Hands On Development Tour. Being a young Rotarian, one of the great things that I get to do is hear amazing guest speakers, talking about how Rotary has assisted them and developed their skills. One of those amazing people that I had the chance to hear from was Stephanie Woollard, who was a Rotary Peace Scholar and is now a member of Melbourne Rotary Club. So, during my school holidays earlier this I year travelled with Hands on Development Study Tours to Kathmandu, and saw first hand the amazing work that Stephanie has done in establishing the Seven Women Centre in Nepal. To see the look of pride and empowerment on the faces of the women, who rightly take pride in their work and showing you around the centre, is inspirational to say the least. We saw first hand the work that the women do creating traditional garments and craft wares. Many of them also teach traditional Nepalese cooking and languages. Being a teacher, I was inspired by Sandea, who gave me a Nepalese language lesson, and told me of her learning Intentions and classroom engagement strategies. Travelling in a group of fellow community minded people was a benefit of traveling with Hands On, as it meant that I could share the cultural experiences with people who would also appreciate the opportunities that we had on tour. As well as seeing community institutions such as the Seven Women Centre, we saw first hand the Fred Hollows Eye Centre and Maiti Nepal Human Trafficking Centre. These are all places which I could use as case study examples for my social justice units back at school in Echuca. We also had the opportunity to canoe and explore the jungle regions of Chitwan National Park, where we rode on the backs of elephants and got close to rhinos, crocodiles and deer. As well as exploring the historical centre of Durbar Square in Kathmandu, we saw first hand the devastating effect of last year's earthquake on the nation. These were just some of the amazing aspects of taking part in a Hands on Development tour to Nepal. I have so many good memories of what I was able to experience on that tour. After hearing about Stephanie's involvement in Nepal and the Seven Women story, I just needed to see it all for myself. 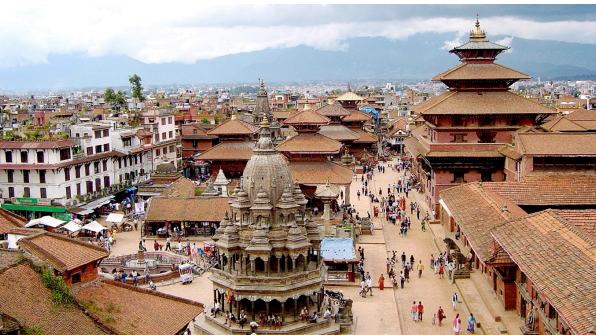 Nepal: the country will surprise you and be far beyond your wildest dreams. The people you'll meet there and travel with will be the nicest and most genuine on the face of the Earth.